For a list of all the wedding thank you notes help pages on this website including our A-to-Z note guide visit A Wedding Thank You Main page. Couples can share in the joy of writing thank you notes. It is not just for brides anymore. The couple or the bride alone signs the note. All wedding thank yous are hand written. You can use pre-printed wedding thank you cards BUT you hand write your thanks inside. Wedding thank you notes can be sent as gifts are received. You do not have to wait until after the wedding. Each gift receives its own note. Refrain from sending any shower/wedding gift combo notes. Guests who attend, but did not send a gift still get a note thanking them for sharing your special day. The amount of time a couple has to send their wedding thank you note varies. Traditional etiquette states that wedding thank yous are to be sent two weeks to a month after you return from your honeymoon. Some people say that you have up to a year from your wedding date. I personally, believe it is never too late AND the sooner the better. Assemble the list of all you addresses in advance. Go back to your computer file for you invitations and update it. Address all your envelopes in advance. Write on the flipside of the gift tag the present and a nice comment about the gift. Alternatively, if you threw away all the tags, you can just put a note in each envelope. This insures you do not have to waste time looking up the correct spelling of the giver’s name or struggle to remember who gave you what. Hint: If one person in the couple has bad handwriting, he or she can be in charge of putting the address labels on the envelopes, stamping them and sorting the tags and notes into the proper corresponding envelope. To make wording your wedding thank you notes easier, print out the thank you notes to use as a reference. 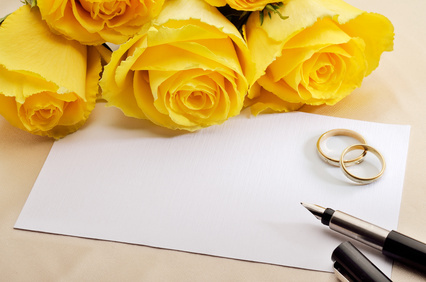 Carry a few envelopes and blank wedding thank you cards with you. When you are waiting at that next doctor’s appointment, fill out a few. Other good times to do this include, waiting for food at a restaurant, in between cycles of laundry, when you can’t sleep, and during commercial breaks. The great thing about doing a few or just one at a time is that it keeps your handwriting neat. Mail your wedding thank you cards immediately. Do not wait to mail them from home all at once. Just put them in the mail as you complete each card. This way you will “have to” hurry up and finish the rest soon, and your stack will be smaller.